Savannah-area resident Tara Nance is filled with gratitude after her daughter, Hope, 14, recovered from brain tumor surgery to remove a dangerous tumor. Tara Nance is grateful for the care Hope received from pediatric neurosurgeon Philipp Aldana, MD, and Wolfson Children’s Hospital in Jacksonville, Florida. Hope Nance has been under Dr. Aldana’s care for nearly four years. It all began when Hope started experiencing migraines that wouldn’t go away, so her mother took her to Nemours Children’s Specialty Care, Jacksonville. The doctor at Nemours referred the Nance family to pediatric neurosurgeon Dr. Aldana, co-medical director of the Stys Neuroscience Institute at Wolfson Children’s and chief of the Division of Pediatric Neurosurgery at the UF College of Medicine – Jacksonville. A high-resolution MRI and CT scan at Wolfson Children’s confirmed that Hope had a small mass about the size of a pea in her cerebellum. 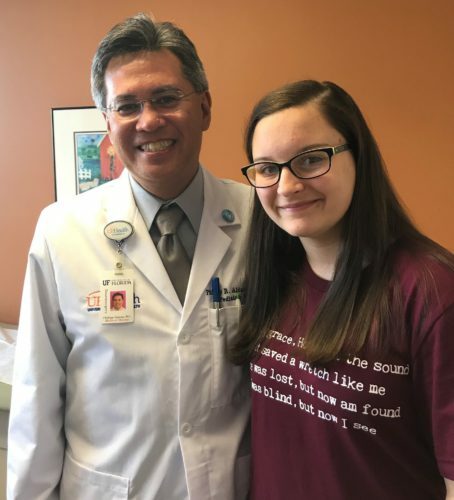 For more than three years, Hope had follow-up MRIs and CT scans and met with Dr. Aldana every three months. Approximately two years ago, the Nance family moved from Jacksonville to Guyton, Ga., north of Savannah. In spite of having to travel two-and-a-half hours each way to outpatient clinic visits, they wanted to remain with Dr. Aldana. Hope continued to see Dr. Aldana every three months and the mass remained the same until December 2017, when the MRI and CT scan showed it had grown to the size of a large peanut. This growth confirmed to Dr. Aldana that it was a brain tumor and he recommended Hope have it removed surgically. A brain tumor is an abnormal growth of cells within the skull. There are many different types of brain tumors that can affect children and teenagers, and they are among the most common types of childhood cancers. The symptoms of a tumor will depend upon the location inside the skull, the size of the tumor and the structures the tumor is pressing upon or changing. Tumors located within the skull may be cancerous or non-cancerous, but in either case they will have to be treated, usually with surgery. Hope returned to Wolfson Children’s Hospital in January 2018 to have the procedure to remove the tumor. To get a better view during surgery, Dr. Aldana used an intraoperative MRI. Not many children’s hospitals in the country possess this special technology. In medical terms, Dr. Aldana removed a low grade astrocytoma, a slow-growing brain tumor. Hope doesn’t require any further treatment, but will need an MRI every three months for the next two to three years to monitor for any changes following the surgery. Whether a child has just received a diagnosis of a neurological disorder or needs ongoing care for his or her condition, the experts at Wolfson Children’s Hospital’s Stys Neuroscience Institute provide early diagnosis, intervention and treatment, and ongoing care for children with neurological conditions. The Stys Neuroscience Institute is a collaboration between Nemours Children’s Specialty Care, Jacksonville, and the University of Florida College of Medicine – Jacksonville, plus other health care institutions that brings together a multispecialty team to help children with brain, spine, skull-base and other neurological conditions. Recently, Wolfson Children’s Hospital of Jacksonville was ranked among the Best Children’s Hospitals in the nation by US News & World Report for its programs to treat cancer and complex neurologic disorders. Within the Stys Neuroscience Institute, there are several multidisciplinary centers specializing in specific types of neurological conditions. This brings together the expertise every child and family deserves when faced with a life-changing diagnosis. The Institute’s disease-specific, patient-centered approach is designed to take a child from diagnosis and second opinion to personalized treatment and ongoing therapy or rehabilitation. Services provided at Wolfson Children’s Hospital are provided primarily by pediatric physician specialists with Nemours Children’s Specialty Care, Jacksonville, and the University of Florida College of Medicine – Jacksonville.